Francis Fukuyama became very famous (some might say notorious) with reviving of the old Hegelian thesis of the End of History via the interpretation of the prominent Hegelian scholar Alexandre Kojeve. 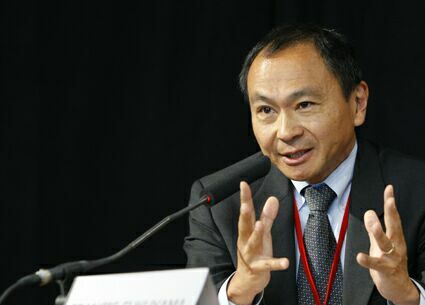 Fukuyama's chief work The End of History and the Last Man (1992)restates and advances his views that democracy has proved to be the best regime in an article by the same name which was written for the journal National Interest in 1989 and can be found here. With the fall of the Berlin wall in 1989 has become the most significant symbol that Liberal democracy prevailed in the Cold War against its archrival ideology - Soviet socialism, thus making it the supreme political ideology and ultimately ending the historical debate. "The triumph of the West, of the Western idea, is evident first of all in the total exhaustion of viable systematic alternatives to Western liberalism." (Fukuyama 1989:1) On the other hand no substantially better political organisation could be conceived. Historically liberal democracy has its little room for improvement. While it is true that in the earlier years of democracy women and workers were not allowed to vote this was an imperfection that could and eventually was readjusted. Following this line of reasoning one should detect the end of history earlier. Fukuyama-Kojeve go back to the battle of Jena of 1806 pinpointing that event as the official watershed when history was decided. In this battle the victorious armies of Napoleon bringing the ideas of the French revolution defeat the monarchical Prussian forces which are an allegory of the old regime. In his book Fukuyama advances also another idea. Following Hegel and contra Marx he gives precedence of ideas over materialism. Furthermore Fukuyama emphasizes on the role of what he interprets to be the Platonic "thymos" or the Hegelian search for recognition. Humans are not driven by mere animal instincts or search for material riches. There is something more. Human beings are driven by the desire to be recognized by others. Only humans could enter into battles of life and death merely for the sake to be recognized. The quest for recognition is at the heart of Hegelian Master-slave dialectic. The essential aims of life are present naturally in every person. In everyone there is some longing for humanity's rightful dignity, for moral integrity, for free expression of being and a sense of transcendence over the world of existences. moral agents-the greengrocer's absent sense of dignity when he agrees to put up the sign "Workers of the World, Unite! " Dignity and its opposite, humiliation, are the two most common words used by Havel in describing life in communist Czechoslovakia. enough, by dangling before them the fruits of modern consumer culture. These were not the spectacular baubles that fueled the greed of the American investment banker of the 1980s, but small things like a refrigerator, a bigger apartment, or a vacation in Bulgaria, which loomed large to people with few material possessions. compromise their moral worth in return. And in making this bargain, the victims of the system became its perpetuators, while the system itself took on a life of its own independently of anyone's desire to participate in it. Fukuyama. F., 1992. The End of History and the Last Man New York: The Free Press.